Motorola has plans for two new mobile sets to cover up the gap left by the company in catering the specific market segment. 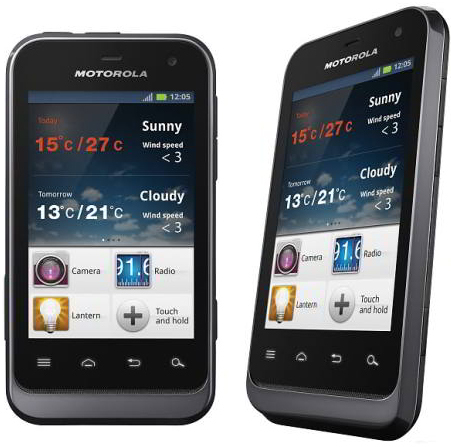 The new models are named thus as MOTOLUXE and Motorola Defy Mini by the company. The MOTOLUXE and the new Defy Mini are about to be on counter sale in Spring time release and will be available for consumers in Greater China, Latin America and Europe areas. The Motorola Defy Mini is new modification to Defy line up. The Defy Mini is boasted as "life proof", as made strong enough to be water and dust proof. Tthe XT320 the new Defy Mini is very like the Defy + which was launched in 2011. The Defy Mini's screen is 3.2 inches and has 320×480 pixel resolution with a Scratch resistant glass. It has Android 2.3 and is powered by a single core 600 MHz processor. Further it is supported by 512 MB of RAM and 512 MB of ROM. Expandable memory can stretch up its capacity to 32GB with its microSD, microSDHC card slot. The back side has a 3 mega pixel camera with LED flash, auto focus and video recording capabilities. On the front, there is a VGA quality camera with features like video conferencing needs on demand. The other imperative features of the phone are GPS connectivity, Bluetooth 2.1, Wi-Fi 802.11 b/g/n, micro USB 2.0 and DLNA connectivity. The Defy Mini seems to be the phone for the need of daily life. MOTOLUXE to be launched with Defy Mini, is not as much strong. With 4 inch LCD touch screen it provides a 480×854 pixel resolution. It is operated on Android version 2.3 and has single core 800 MHz processor, a graphics processor, 512 MB of RAM and 1GB of ROM. It has slots for microSD or microSDHC memory slots for extendable storage. The MOTOLUXE also has an ideal 8 mega pixel camera with LED flash, auto focus, video recording, and a VGA quality shooter from the front up front. It also has all necessary gadgets fulfilling to modern day requirements like GPS, Bluetooth 3.0, micro USB 2.0, Wi-F9 802.11 b/g/n and DLNA compatibility.